Source Measure Unit - mb-techs Webseite! Source Measure Units are used in almost all test systems from mb-Technologies: Fast, powerful and accurate voltage and current sources with build-in voltage and current meter. Models are available up to 300 Volts, 20 Amps and 100 Watts with a measurement resolution in the µV and fA range. Any number of SMUs can be used in one test system. Each SMU executes its own test program locally and at maximum speed. 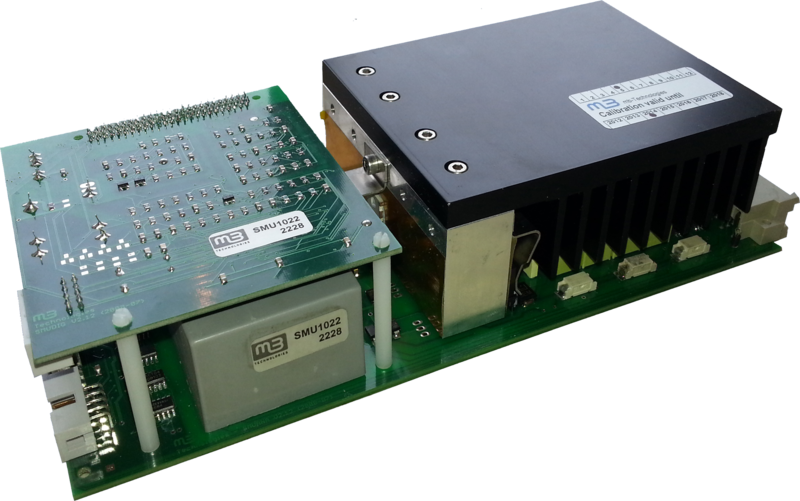 If more than one SMU is used in one test program they synchronize to each other automatically using a local high-speed bus. The high measurement speed allows a full characterization of a device to be done in a few seconds. Data transfer between PC and test system is done in the background without slowing down the measurement. Each Source Measure Unit either works as voltage source with bipolar current compliance or current source with bipolar voltage compliance. All four quadrants can be used without restrictions. 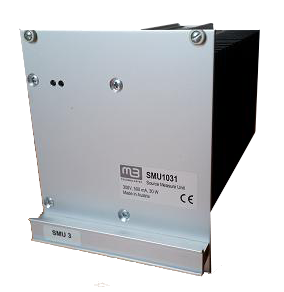 SMUs can also be used as voltage meter, current meter, resistance meter or capacitance meter.